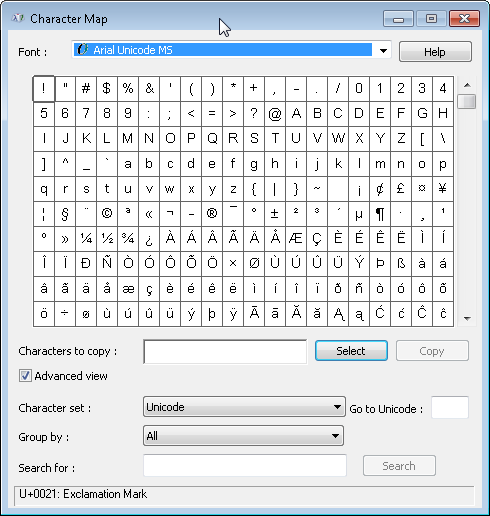 The Character Map utility is free on all Windows machines and can be used to copy and paste accented letters and other foreign language characters characters into any Windows application. 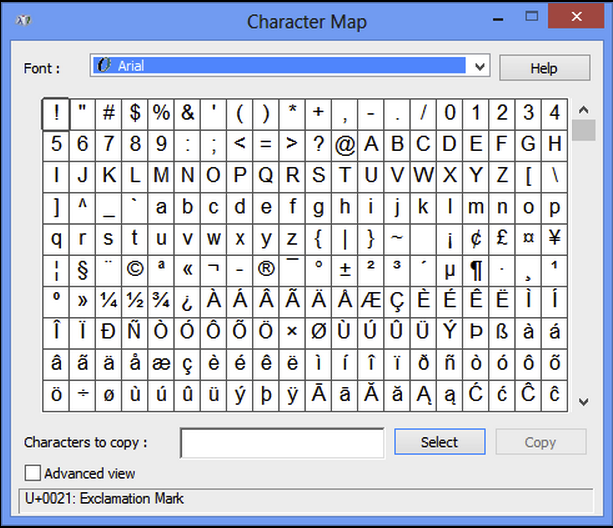 The Character Map is similar to the Insert Symbol tool found in some Windows applications such as Microsoft Word. Click on the Start (Windows Icon) menu in the lower left, then select All Programs. Select Programs » Accessories » System Tools » Character Map. TIP: If you use the Character Map a lot, you may want to make a Shortcut (alias) to it on your Desktop or add it to your Start menu. A window should open which displays a series of characters in a grid as in the images below. Windows 7 Character Map. The Vista Character Map has a similar appearance. Make sure that the Font from the dropdown list matches that of the document you are creating. If you doing some other function, such as filling out a Web form, select Times New Roman as the Font. Look in the grid for the symbol you want. If necessary, use the scroll bars on the right to view more characters. NOTE: Many Windows fonts include Cyrillic and Greek letters by default. For other scripts, use Arial Unicode or some other appropriate font. or some other appropriate font. To narrow selection by Unicode block, check the Advanced View at the bottom to reveal additional menus. In the Group By menu, select a Unicode Subrange to open a pop-up. Click the block to see available characters in that font. Windows 7/Vista Character Map with Advanced options visible. Double-click on any character you wish to insert then click the Select button to make it appear in the Characters to Copy field. You can Select more than one character at this time. Highlight one or more of the characters in the Characters to Copy field you wish to insert then click the Copy button. Character Map with “Select” and “Copy” buttons highlighted. Minimize from the Character Map window, and open or switch to the application window in which you wish to insert the character. Position your cursor in the location you wish to insert the character. Under the Edit Menu, choose Paste (or use the keyboard shortcut Control+V). The character should appear. If necessary, change the font of the inserted character to the one selected in the Character Map.